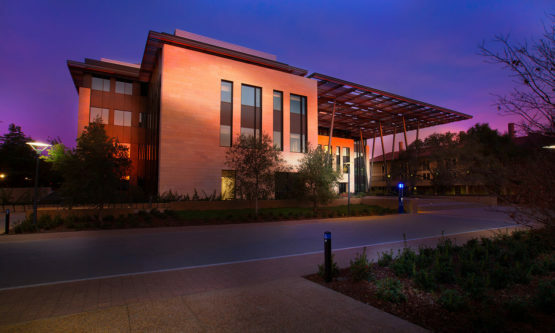 In the new Anne T. and Robert M. Bass Biology Research Building, which will be formally dedicated this week, Stanford biology faculty and students once spread across campus are now together under one roof. Here, experts in areas such as ecology and evolution are working next to molecular and cellular biologists in communal spaces that promote both intellectual and social interactions. Bass Biology is dedicated solely to research in the life sciences and provides laboratory space for Biology Department faculty and staff, as well as hundreds of graduate students and postdoctoral fellows. Construction of the five-story structure was completed last summer. Faculty have been gradually relocating their labs into the building since the fall. The building was made possible by a gift from Anne T. Bass, MLA ’07, and Robert M. Bass, MBA ’74, longtime Stanford volunteers and donors. The couple have provided counsel and extraordinary philanthropic support to four university presidents, many deans, and dozens of faculty to advance Stanford’s mission of teaching and research. Anne Bass is a longtime children’s health advocate, both at home in Fort Worth, Texas, and at Stanford. She has been a member of the board of directors for the Lucile Packard Children’s Hospital Stanford since 2000 and co-chaired two of the hospital’s campaigns. She is a long-serving member of the H&S Council and also served multiple terms on the Stanford Athletic Board and the Parents’ Program Advisory Board. Robert Bass is founder of the American aerospace firm Aerion Corp., president of his investment holding company Keystone Group LP and the founder of the Oak Hill family of investment funds. At Stanford, he served five terms as a member of the Board of Trustees, from 1989 to 2018, including as board chair from 1996 to 2000. His primary focus was on the Land and Buildings Committee, reshaping the campus as it has grown. He is a director of the Stanford Management Company (SMC), which oversees the university’s endowment. He was a founding director of the SMC Board in 1991 and served as chairman from 2000 to 2004. Robert is a trustee of Rockefeller University, Middlesex School, and the Amon Carter Museum. He is chairman emeritus of the National Trust for Historic Preservation and Cook Children’s Medical Center in Fort Worth. Together, the Basses have been active in many of Stanford’s major fundraising campaigns. 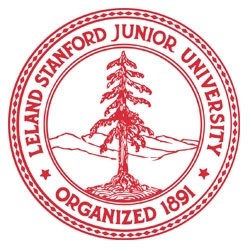 They endowed five chairs in the School of Humanities and Sciences during Stanford’s Centennial Campaign. They served as co-chairs for The Campaign for Undergraduate Education and created the Bass University Fellows in Undergraduate Education Program, which recognizes faculty for their exceptional contributions to undergraduate education. During The Stanford Challenge, they served on both the steering committee and leadership council. In 2013, the Stanford Associates awarded the couple the Degree of Uncommon Woman and the Degree of Uncommon Man, the university’s highest honor for rare and extraordinary service. Situated on Campus Drive between the Clark Center and the Sapp Center for Science Teaching and Learning, Bass Biology is the cornerstone of Stanford’s new quad, which connects with the School of Medicine via Discovery Walk. This walkway, which runs through the medical school to Stanford Bio-X in the Clark Center, highlights the connection between foundational and applied research in the quest to improve human health. The building’s close proximity to other departments at Stanford – such as computer science, statistics and engineering – will help promote collaborations and interactions among faculty and students from different academic disciplines. “Biology is at the nexus of the sciences at Stanford. Development of a quad, with Bass Biology as one of its anchors, is very exciting because it creates a new focus for the natural sciences on the campus,” said Tim Stearns, the Frank Lee and Carol Hall Professor at Stanford and chair of the Biology Department. In the past, the Biology Department’s faculty and students were split across five aging buildings. This physical separation ran counter to the collaborative nature of modern science. In Bass Biology, faculty and their labs are purposefully arranged to create beneficial adjacencies that enhance collaboration. The 133,000-square-foot building is divided into wet labs for hands-on research and computational or “dry” labs. Hybrid research spaces combining both types of labs are also available. “We’re extremely excited about and grateful for this new space, which seems ideally designed for sparking creativity across teams,” said Gretchen Daily, whose lab has relocated to the new building. Daily has been honored for her contributions to undergraduate teaching as a Bass University Fellow in Undergraduate Education. She is also the Bing Professor of Environmental Science and director of the Natural Capital Project, which is advancing a systematic, science-based approach for integrating the values of nature into policy and finance worldwide. “Bass Biology will give us a huge boost within the Biology Department, as we have many innovative collaborations with different labs and with the nearby Medicine and Engineering schools,” Daily said. Designed by Flad Architects and Ennead Architects, the limestone-clad, two-wing structure is connected by an enclosed bridge on the upper floors. The slats in the multi-story pergola that shade the building’s entry are meant to be an evocative reflection of the bands in gel electrophoresis, a common laboratory technique. Incorporated throughout the building are multiple storytelling elements. 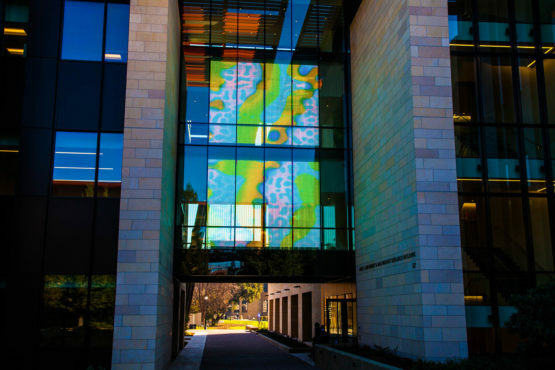 For example, a two-story interactive “media mesh,” visible from Campus Drive and the medical school, displays biology-themed abstract images that are controllable through a touch-screen interface near the building’s entrance. 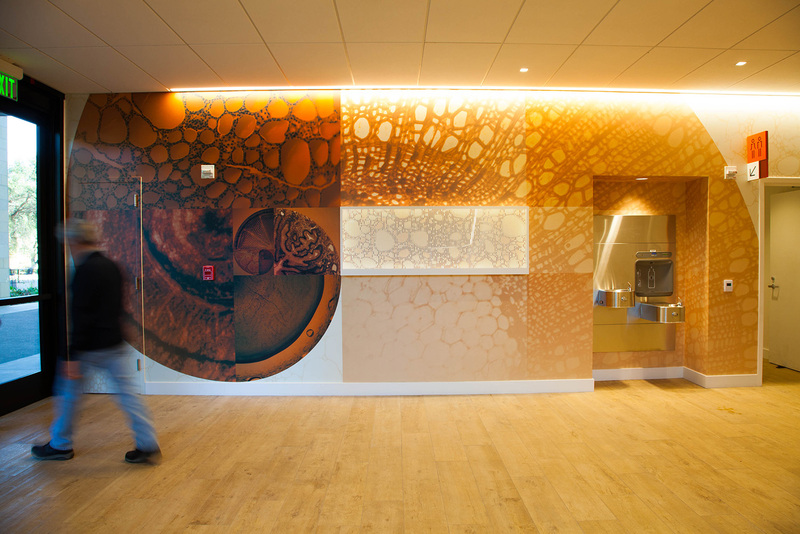 The first-floor lobby and entranceway of Bass Biology also features an art installation called “Pacific Cadence” to provide a visual presence on campus for Hopkins Marine Station, which is affiliated with the Biology Department. “Pacific Cadence” is made up of photographic collages of the ocean’s surface that are seamlessly knitted together to give a sense of the vast, complex and ever-changing nature of the Pacific Ocean. An open house event for Bass Biology will be held on March 21.